When you step into Barley Labs, you’ll be welcomed in with barks and wagging tails. Theresa and Scott – the hearts and brains of the business – will likely follow suit in greeting you with their genuine smiles and tasty beverages. Homemade dog treats and Barley Labs merchLooking around, you’ll see a multitude of colors, a variety of dogs, and elements that can be summed up in one word: community. It’s on their walls, on their shelves, in their dog treats, and it’s what’s on tap. Theresa and Scott utilize leftover spelt grain from Fullsteam Brewery while implementing other delicious flavors to make their treats tasty. Their favorite flavor is cheese (and yes, they’ve braved them all to try them); however, their best seller is peanut butter. Whatever you pick for your furry compadre, rest easy and know that they are all free of corn, soy, and wheat! The growing success of their treats, along with their desire to create a space for dog and beer lovers, led to the birth of Barley Labs. On one wall, you will find colorful handmade collars from a local artisan. On another, you will see shelves showcasing bottles large and small of stouts, sours, ciders, wine, and kombucha from North Carolina and from other friends across the nation. A small table towards the back houses games for humans and pups. They have several mats for our furry friends to lay on, a water-bowl hydration station, and homemade treats at the human bar. The best part: they have carabiners lining the bar that act as dog hooks which allow us humans to use both hands! Your pup doesn’t like to be touched? No problem! Barley Labs provides yellow ribbons to let others know to use caution and give a furriend some space. What’s on tap? Big Boss, Bull City, Foothills, Fullsteam, Lenny Boy, Mother Earth, and Raleigh Brewing, to name a few. Can’t do beer? They have cider. Don’t like cider? They have wine. Bringing in your 17-year-old nephew? They have kombucha. He doesn’t like kombucha? Their water sure is tasty. Growler discounts on Tuesdays, dog seminars on Wednesdays, free beer tasting on Thursdays, and small biz seminars on Saturdays. Check out more event details at www.barleylabs.com. Barley Labs only has four rules: keep it clean, ask first, leash up, and be kind. So grab a dog (preferably yours), grab a friend, or come solo. You’ll make at least two friends behind the bar, and you may even catch a sweet date in this unique location – we all know that dogs and their noses take us places we weren’t expecting. Get 10% off non-alcohol purchases on Wednesdays with your Shop Durham card! 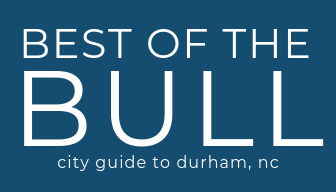 This article was contributed to Best of the Bull by the incredible, Melanie Ray! If you’re interested in writing for us, check out this page. Hi Bull City! @Melny here. I grew up down the road in Cary and graduated from NCSU. After a time or two around the globe, I'm back to my NC roots and am slowly making Durham home. I'm a pediatric nurse and can typically be found with my fluffy dog who looks like a muppet, hiking a trail, or baking and creating in my kitchen. I love whiskey and believe the world needs a whole lot more kindness, humor, and ice cream. Happy to be here!